As they sought to close out the San Antonio Spurs on Wednesday night, the Oklahoma City Thunder needed to keep scoring in the fourth quarter. To do so, they went to that play that confused the San Antonio defense and allowed Kevin Durant to score 16 straight points in the fourth quarter of Game 4. They went to their pin-down play, where Russell Westbrook sets a pin-down screen for Durant as James Harden handles the basketball. The scheme produced 10 points on just four possessions, and each time they ran it, the Thunder went to a different option and a different player scored. 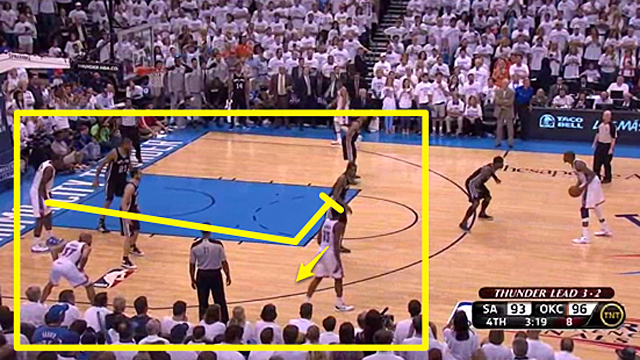 The first iteration was a play for Durant. He didn’t knock down an open shot, but rather used the pin-down screen to draw a foul. Stephen Jackson is guarding Durant. Not only does he have to remain attached to Durant to prevent him from making the catch, but now he has to fight through a Westbrook screen as well (and he sets effective screens for a point guard). Jackson is forced to put his hands around Durant to stick with him, and a foul is called. 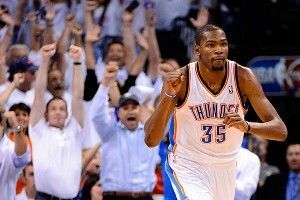 Durant knocks down both free throws, stretching the Thunder’s lead to four. 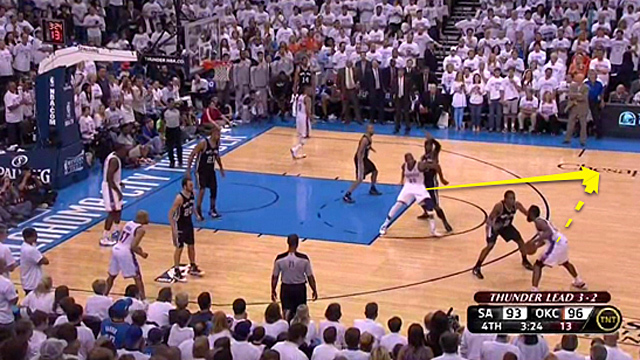 On the next Thunder possession, the Spurs were determined to not let Durant even catch the ball. But that decision opened other options. We pick up this possession with Harden holding the ball on the wing, while Westbrook sets the pin-down for Durant. Tony Parker leaves Westbrook to double Durant as Jackson fights through the screen. Then the open Westbrook dives to the rim. He forces the Spurs to react. 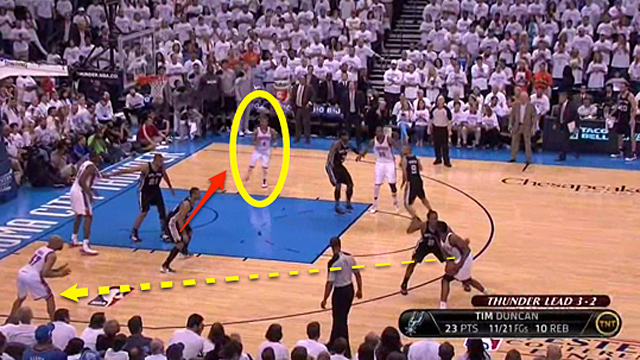 Gary Neal rotates over even though there are two Spurs closer to Westbrook than he is. 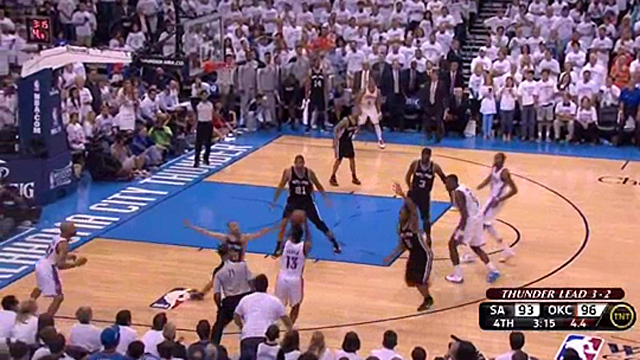 Neal’s man, Derek Fisher, is only one pass away from the basketball, and Harden passes to him. This pin-down puts a lot of pressure on the defense. The Thunder keep stretching them to find open shots for their many scorers. However, stretching the defense isn’t the only function of the pin-down. The next iteration we saw was a diagrammed play for Harden. Again, we pick up this possession after Westbrook sets the pin-down screen for Durant. Jackson ably stays with Durant here, preventing him from making the catch on the free throw line, forcing him out to the 3-point line. Durant makes the catch far away from the rim and with just eight seconds left on the shot clock, so the Thunder go to their next option. They bring the ball back to the strong side, where three guys are positioned. Kendrick Perkins slides up and sets a screen for Harden as he flares behind the 3-point line. 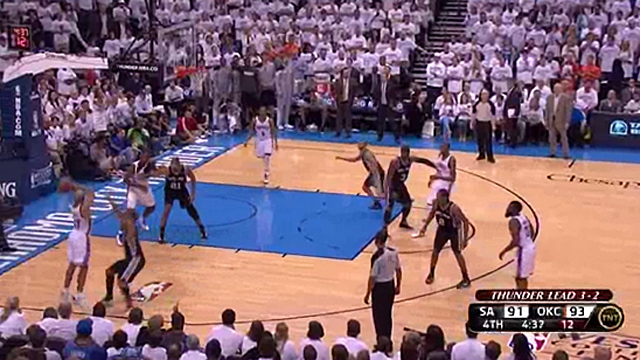 Perkins’s screen drills Harden’s man, so Harden is open to get the ball from Durant. Now Manu Ginobili is in a tough spot because Fisher is in the corner and Harden is on the wing. He gets to Harden late, allowing Harden to knock down the 3. Here is the play in real time. Durant demands the defense’s attention as he holds the ball at the top of the key. The Thunder capitalize on this by setting screens off of the ball, and Perkins’s screen isn’t called out, which allows Harden to get open. 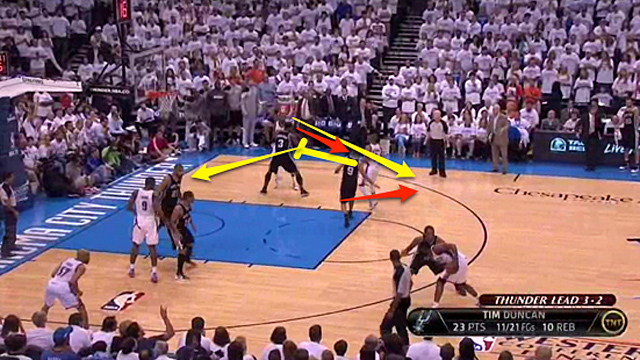 During these two 3-point shots, Westbrook sprinted to the basket immediately after he set the screens for Durant. He was open both times, but Harden was unable to find him for various reasons (good ball pressure, strong rotations). Following a timeout, Oklahoma City coach Scott Brooks drew up a play out of a timeout to take advantage of the lane the Spurs gave him. Westbrook gets the basketball to Harden and starts toward Durant to set the screen. Right before Durant gets to it, Westbrook slips the screen and cuts right to the rim. Parker was worried about Durant, so Westbrook was able to get free, and he converts the easy cut-and-pass, finishing at the rim. This play is so effective because there are many possible outcomes, as we’ve now seen. As San Antonio altered their defense to stop it, other options opened up. The Thunder are able to read the defense and react accordingly, which makes them even scarier as they prepare for the NBA Finals.